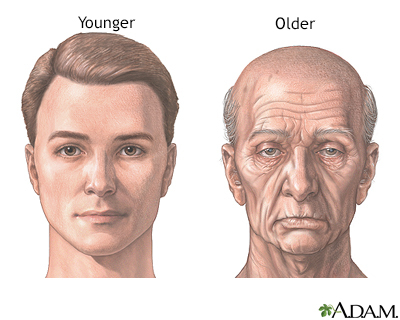 The appearance of the face and neck typically changes with age. Loss of muscle tone and thinning skin gives the face a flabby or drooping appearance. In some people, sagging jowls may create the look of a double chin. Your skin also dries out and loses the underlying layer of fat so that your face no longer has a plump, smooth surface. To some extent, wrinkles cannot be avoided. However, sun exposure and cigarette smoking are likely to make them develop more quickly. The number and size of blotches and dark spots on the face increase as well. These pigment changes are largely due to sun exposure. Missing teeth and receding gums change the appearance of the mouth, so your lips may look shrunken. Loss of bone mass in the jaw reduces the size of the lower face and makes your forehead, nose, and mouth more pronounced. Your nose may also lengthen slightly. The ears may lengthen in some people (probably caused by cartilage growth). Men may develop hair in their ears that becomes longer, coarser, and more noticeable as they age. Ear wax becomes drier because there are fewer wax glands in the ears and they produce less oil. The hardened ear wax can block the ear canal and affect your ability to hear. Eyebrows and eyelashes turn gray. As in other parts of the face, the skin around the eyes gets wrinkles, creating crow's feet at the side of the eyes. Fat from the eyelids settles into the eye sockets. This can make your eyes look sunken. The lower eyelids can slacken and bags can develop under your eyes. Weakening of the muscle that supports the upper eyelid can make the eyelids droop. This may limit vision. The outer surface of the eye (cornea) may develop a grayish-white ring. The colored portion of the eye (iris) loses pigment, making most very elderly people appear to have gray or light blue eyes. Brodie SE, Francis JH. Aging and disorders of the eye. In: Fillit HM, Rockwood K, Young J, eds. Brocklehurst's Textbook of Geriatric Medicine and Gerontology. 8th ed. Philadelphia, PA: Elsevier; 2017:chap 95. Donofrio LM. Evaluation and management of the aging face. In: Robinson JK, Hanke CW, Siegel DM, Fratila A, Bhatia AC, Rohrer TE, eds. Surgery of the Skin. 3rd ed. Philadelphia, PA: Elsevier; 2015:chap 23. Facial skin tends to wrinkle with age.